Until we all collectively decide that avocado was the Quiche of the Twenty-Tens, we still have to deal with the prices. Sometimes my Whole Foods will run deals on avocados, but usually they fall somewhere between $1-$2 each. This is fine if I'm buying an avocado to garnish my nachos or my grain bowl, but if it's going to be the star of the show, like say, in a guacamole, that high price tag starts to hurt a little more. And then there is also the part where apparently our avo obsessions are driving the Monarch butterflies to extinction. More food guilt, yay. Have you met my friend the chickpea, though? He's truly a wonder: full of protein, fiber, and vitamins, and running at the low, low cost of less than $2 per pound. 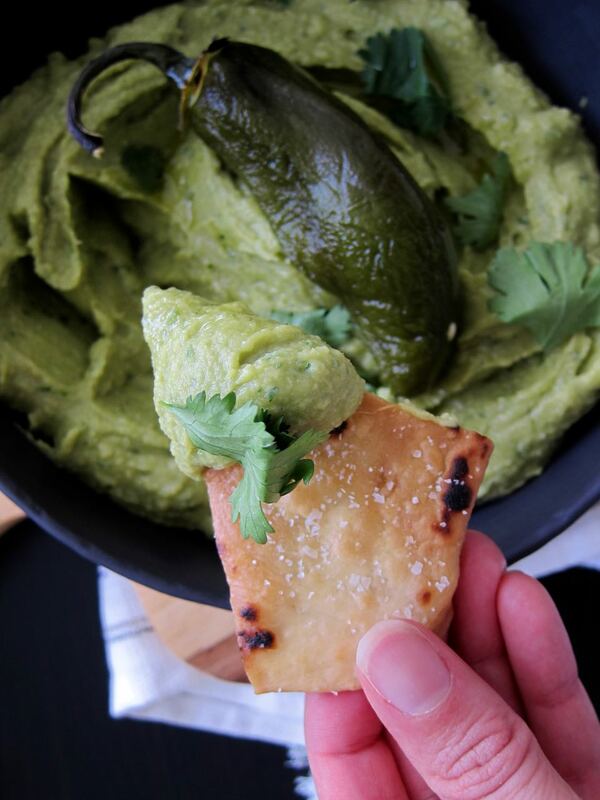 And, a new superpower I recently discovered is the chickpea's ability to seamlessly blend in with a couple of avocados to create a smooth, creamy, hummus/guac hybrid dip that is only made better with the addition of roasted jalapeno. So, if you generally like having money in your wallet and pretty butterflies, can I recommend a cheaper, spicy, avocado-full crowd pleaser that you could serve at your next Summer party? 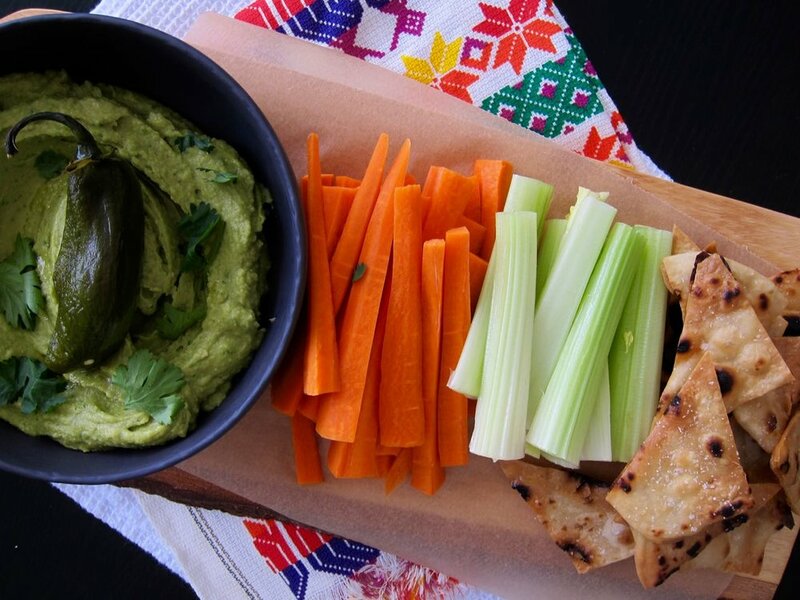 It's amazing on your standard hummus friends like carrots and celery, and equally tasty on some homemade tortillas lightly fried into chips. Ok, that last combo is actually incredibly addictive, so proceed with caution. *Just FYI, take a look at my avocado expenditures and compare them to my rent expenditures and my student loan payments, and I promise you, the reason I can't afford to buy a home has nothing to do with my snack choices. Soak chickpeas for at least 4 hours or overnight, with 1 tsp of the baking soda and enough water to cover. Drain the chickpeas, then transfer to a large pot and cook with remaining 1 tsp baking soda and enough water to cover the chickpeas by 4 inches. Cook at a simmer for 1 to 1 1/2 hours, until chickpeas are very soft. Drain and cool. Blend all remaining ingredients in the bowl of a food processor until creamy. Add chickpeas and pulse until fully blended. Taste and adjust seasoning. Serve with assorted veggies and chips for dipping!